People often ask him if the story is true and if the friend is real. Yes, the story is true and the friend is none other than Felipe Esparza. The two met very early in their careers and became lifelong friends. Esparza’s road has been rocky at times, but he never loses sight of the one thing he wanted most in life, to be a comedian. He was a young immigrant growing up in the projects in East L.A., a teenage father with drug and alcohol problems, and spent time in rehab before the age of 21. Those experiences feed his material. Through all of it, humor was his constant companion and his light in the darkness. His desire to become a comedian became his strength and his reason to overcome his history. And his ability to laugh at himself has made him one of the most popular comics on the road today. During his early years as a comedian, Esparza was part of the successful stand-up comedy TV show, “Que Locos” on Galavisión (the only English-speaking show on Spanish television). That show and the resulting tour helped launch the careers of several other Latino comedians such as George Lopez, and Willie Barcena. Esparza spent years opening for Iglesias and iconic comedian Paul Rodriguez, before selling out venues on his own. Today, in addition to his live stand-up touring, he hosts a weekly podcast on the All Things Comedy Network called “What’s Up Fool?” that focuses on interesting stories from just about anybody. He produced his second hour-long stand-up special with his wife Lesa, entitled “Translate This”, which premiered on HBO Sept. 30, 2017. Esparza first appeared in Laughlin in 2014, as part of the “Laughlin Laugh Fest,” and now returns to Laughlin to perform at the Edgewater’s E Center, Saturday, Sept. 15. Do you ever just sit and think about how far you and your career have come, how things could have turned out so differently? Esparza: I think about that when I go home, when I go to my mom’s house. She lives in Boyle Heights, and sometimes I run into old friends, friends that are my age and they’re very happy for me. But I think about that in my life, I could have been that guy who still lives in the neighborhood and he’s not doing so well. What is the craziest thing that has happened to you as a result of your success? Esparza: When I won “Last Comic Standing,” someone emailed me from the past and wanted $10,000. I got in a fight when I was 19 years old, there were these three guys and they were going to beat me up. I remember running and I was knocking on people’s doors, yelling, “these guys are going to beat me up, help me.” And this guy found out, and he came out of his house to help me — he thought that was worth $10,000. How have you evolved as a comedian? How has your material changed? Esparza: My comedy has been evolving from the beginning. When I started standup comedy, I was a deadpan comedian like Stephen Wright. And little by little I evolved into a storyteller, joke-writing comedian. I think back when I would talk about stuff that hurt me personally as a child, it was hard to tell those jokes years ago, but now it’s self-healing for me. I tell a joke about child abuse—people don’t really talk about child abuse anymore — but when I was a little kid, like most kids of my generation, we would get hit by a belt. Nowadays you really can’t hit kids with belts because, they put it on Snapchat, and you’ll go viral as an abusive father. Kids now will rat you out, you know (he laughs). Did you always look at comedy as therapy, bringing the demons out into the open? Esparza: Yes I did and it has been like therapy to me. When we were little kids, we used to have VHS tapes and we would watch Rodney Dangerfield and me and my friends would just laugh and laugh. Then we would talk about how my mom hit me, how my friend’s mom would hit him and we would just compare child abuse stories. What kind of feedback do you get at your shows from people? Esparza: I have people walking up to me at shows high-fiving me, saying you read my life. Esparza: I feel like I’m not alone, I feel like all those times when things were happening to me, I feel they were happening to everybody and we’re not alone. We just got hit by different belts. Things have been going really well for you since the last time you were in town. Esparza: The last time I was in Laughlin it was for Laughlin (Laugh Fest). It was a great experience being out there. I’d never been to Laughlin before to do a comedy show. I’d only been there to lose money at the Flamingo. Laughlin is part of your current tour? Esparza: I’ve been touring on this “Bad Decisions” tour since last November and we’re going strong, I think we’re going to continue doing the tour until I shoot my new one-hour special next year. It’s about time for a new special…we’ve been waiting. Esparza: I’ve been waiting, man, and it’s going to be different this time. I think I have to do a Spanish show, too. I don’t know, but I’m going to do a one-hour special and then translate the whole thing in Spanish, for Spanish-speakers. When is the special coming out? Esparza: December of next year or January of 2020. We’re also working with Universal about the possibility of doing a new sitcom. My wife and I are going to start pitching a show in the next two weeks. I keep busy every day. 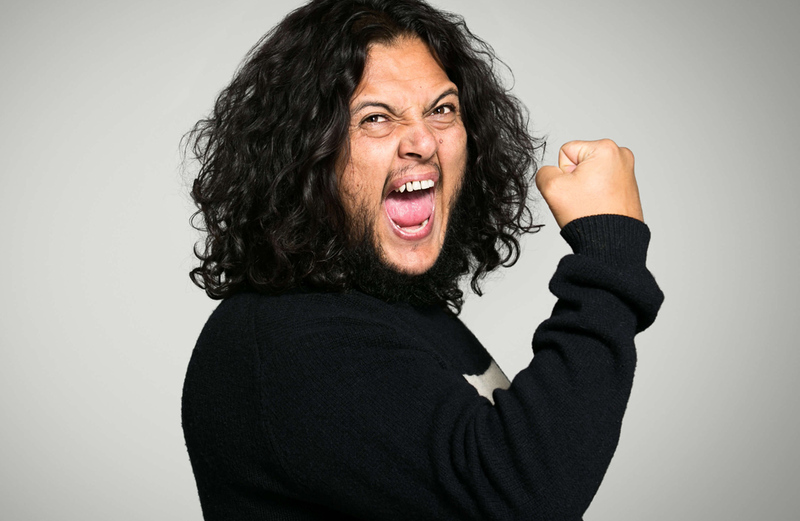 You can check out my podcast “What’s Up Fool?” on my web page, FelipesWorld.com, follow me on Twitter, funnyfelipe. We go live every Wednesday at noon West Coast time on YouTube.com.atc. You can listen and watch my podcast live, or wait ’til Friday and listen to it on iTunes. What’s new in your world these days? Esparza: I’m a regular on Superstore, a TV show on NBC, I play Cody. Also I was lucky to be a guest on the Joe Rogan Experience podcast. It’s like the biggest podcast in the world. He gets like 3 million downloads a week. Yeah, that’s wild. Talk about the acting you’ve been doing. Will there be more of that in the future? Esparza: I love it, but I found acting very hard in the beginning. Even in acting class, I still found it hard. I’m less confident in my acting than I am with my comedy. But I’m working on it. Comedy is easy because I wrote down the words myself. It’s hard to read other people’s words. Your comedy is honest and original and there are guys who can’t write a joke to save their lives. What do you think about that? Esparza: I don’t know how these people do it, like someone can sit there and write a good joke. I can write a good joke, too, but I find it easier to write plenty of jokes if I’m telling about my life and what happened to me. People remember those jokes and they relate to them more. What’s in store for Laughlin? Esparza: We’re gonna have a very funny comedian as an opener. He’s been on “Def Jam.” He has opened up for Kool & the Gang, and he has opened up for the Gap Band. He’s like a beat-box musical comedian, he knows how to imitate Marvin Gaye, and he knows how to do a lot of voices, so he’s going to be very entertaining. His name is Jay Lamont. Then we have Rodrigo Torres, he’s the co-host of my podcast, “What’s Up Fool?” This time I will work and try not to lose money at the casino.